Bring your family to Crescent Towers I in North Myrtle Beach, SC and you will have the gorgeous Atlantic Ocean in your backyard and a sparkling blue swimming pool in your front yard. The North Myrtle Beach vacation rentals located at this North Myrtle Beach resort are spacious, well maintained and full of amenities that are destined to make your North Myrtle Beach vacation better than you ever imagined. The North Myrtle Beach vacation rentals at Crescent Towers I feature two bedrooms and two baths. They are designed to accommodate up to six people. With two people in each of the two bedrooms and two more people on the comfortable sleeper sofa in the living room, these condos in North Myrtle Beach, South Carolina give everyone ample room in which to spread out and enjoy an oceanfront vacation. There is no need to live out of a suitcase and a cooler during your North Myrtle Beach vacation at Crescent Towers I. This North Myrtle Beach resort has plenty of closet space and a fully furnished kitchen with cookware, dishes and full-size appliances. Hang up your clothes and use the drawers that are available for your family in these North Myrtle Beach condominiums. In the kitchen you can take full advantage of the refrigerator by swinging by the nearby grocery store and keeping soft drinks and juice in the fridge so they are cold whenever you want them. Keep sandwich ingredients on hand so you make a sandwich during the afternoon and popcorn is ideal for the evenings, especially because there is a DVD player in each of these condos in North Myrtle Beach, South Carolina. Have a movie night during you North Myrtle Beach vacation at Crescent Towers I. 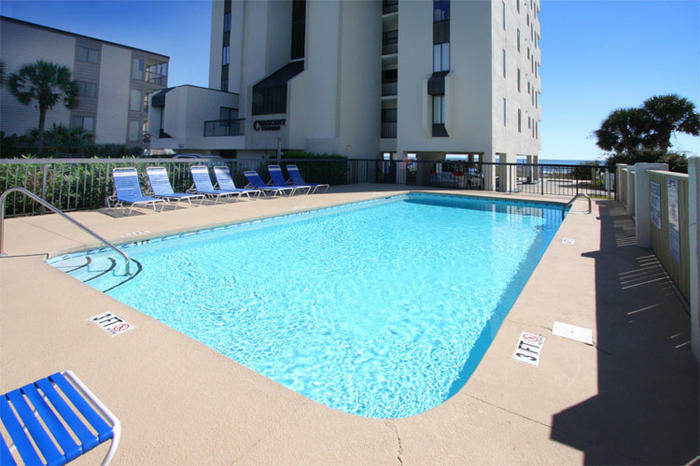 These two-bedroom North Myrtle Beach condo rentals have a kitchen that features a stove and oven in addition to a dishwasher. The microwave and coffee maker are absolute necessities during a beach vacation, especially when there is an oceanfront balcony on which you may enjoy a cup of coffee first thing in the morning. These condominiums in North Myrtle Beach, South Carolina also have a washing machine and clothes dryer so you can feel free to play hard and get dirty and sweaty because when you vacation at Crescent Towers I you will be able to easily wash clothes without ever leaving the comfort and privacy of your North Myrtle Beach condo rental. There is a dining area in these North Myrtle Beach rentals that is as suited for eating meals that you prepare in your own North Myrtle Beach condo as it is for playing games and writing old-fashioned postcards. The oceanfront is divine and can be thoroughly enjoyed from the privacy of your balcony. Enter this oceanfront balcony from both the living room and the master bedroom of your North Myrtle Beach condominium at Crescent Towers I. The sunlight streams inside your North Myrtle Beach rental and when you open the sliding glass doors that lead to the balcony you also let in the sound of the crashing waves and the crying seagulls. Sleep with these doors left open just a tad and the beachfront sounds might lull you into a peaceful slumber. Rise with the sun and catch the oceanfront sunrise while you are still in your pajamas during your North Myrtle Beach vacation at Crescent Towers I. All guests have an oceanfront sunrise opportunity as all of these North Myrtle Beach condominiums have an oceanfront balcony. Slip into the sparkling blue swimming pool for a refreshing dip. Whether you are one for swimming laps or just kicking around with the kids, the swimming pool at Crescent Towers I is quite inviting. You can even relax poolside as the lounge chairs surround this blue swimming pool and encourage guests to spend a little time by the pool reading, talking and napping. In addition to this on-site fun at Crescent Towers I you can find a wide array of activities just minutes from this North Myrtle Beach resort. Fishing and golf are two of the North Myrtle Beach area’s most popular pastimes. Finding ways to do both is quite easy as there are fishing piers, boat rentals, head boats, charter boats and more than 100 Myrtle Beach golf courses in close proximity to Crescent Towers I. Getting outside and playing on the fairways, near the waterways, at miniature golf courses and around state park hiking trails is easy. There are water slides, amusement rides, the newly opened Myrtle Beach SkyWheel and go cart rides around town. Shopping, dining and live entertainment theatres are also scattered in all directions of Crescent Towers I. Go parasailing. Ride a Sea Doo in the Atlantic Ocean. Take the whole family on a banana boat ride. The fun doesn’t stop when you spend a beach vacation in North Myrtle Beach, South Carolina. Elliott Beach Rentals is not affiliated with onsite management or the HOA of Crescent Towers I.